Heat oil and sauté the ground spices until fragrant and dry.Set aside and allow to cool. Divide into 2 parts.Combine 1 part with cassava leaves.Stuff the mixture into the chicken and secure with toothpicks. Rub the chicken with the remaining ground spices.Wrap the chicken with banana leaves and tie with a string. Grill in the oven at medium heat (180oC) for 2-3 hours or until cooked.Remove from heat and cut before serving. Note : Another way to cook the chicken is to steam it for about 45 minutes before grilling in the oven for 1 hour. Betutu is a special dish from Bali. 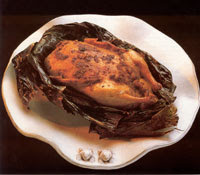 Usually the Balinese use duck wrapped in banana leaves, and wrapped again with stalks of palm leaves. The duck is then buried in the ground and covered with hot charcoal for 6-7 hours until cooked. Maaf rasanya ada yng hilang dalam memproses ayam betutu.....salam dari pencinta masakan ( pendatang baru),minta petunjuknya lebih lanjut. Food Lorists All about food, cooking and kitchen science!